Aren’t birds fascinating? From poets to realists, conservatives to activists, the existence of birds cannot be denied. Birds are a symbol of many things – freedom, awakening, a new beginning, a different adventure. Birds soaring high in droves can evoke feelings of nostalgia; their sweet and joyful chirpings are music to the ears. How you must love to wake up to birds singing! Over and beyond this, birds are necessary for man to survive and continue to exist in this world; they are part of our ecosystem. As pollinators and seed dispersers, they help in plant reproduction, and bringing nutrients back to the earth is actually part of what they do. So it’s only right for man, for us, to prevent the birds’ extinction and also to make sure that the world they live in will always be home for them. But when there are far too many birds hovering in your backyard, dropping poop everywhere – outside your window, on your patio or porch, well, that’s another story, isn’t it? Why, because there’s really nothing pleasant about looking after and cleaning up their poop. Didn’t we say birds are necessary to our existence? We, therefore, will not want to use force (as much as and whenever possible) to keep the birds off the grass, the pool, the deck, or wherever. What we will want to make use of are reflectors and lights because birds generally hate lights; they’re blinded by them and practically by anything that flashes and reflects. So one effective strategy to use here is to stick some flashy tape (this you can find in garden stores) around certain areas you want to “bird-proof”. Create a neat border around your patio, your pool, or your deck. They’ll make a really nice decor, and will keep the birds away, too. You can also use the aluminum foil trick to keep the birds from coming back. Cut out large squares of foil and hang them on trees or some other tall structures. If you bury the foil underneath your garden soil, it will also discourage the birds from pecking at your beloved plants. Using approved bird deterrents such as plastic bird spikes and other sonic bird deterrent devices is a trick that works really well today. Another way you can repel birds is to have a fake predator nearby. You don’t have to use a scarecrow to scare the crows literally. A large toy snake or owl will seem, to the birds, real, and that will scare them away just as much as if it’s a scarecrow. Cover and protect your pool with a heavy-duty tarp. 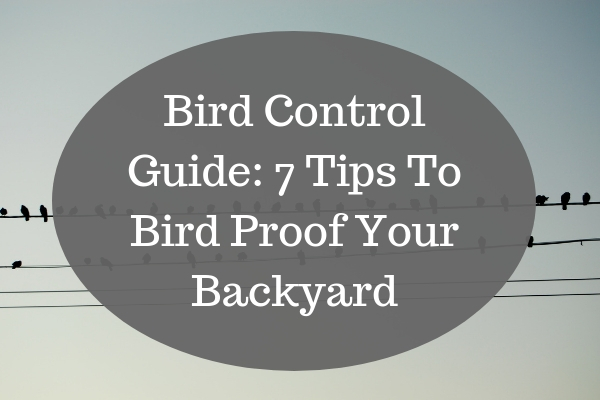 What can be more annoying than removing bird droppings from your pool? If you hate the idea as much as any pool-owner out there, the solution is pretty obvious, plain and simple – keep your pool covered when you’re not using it. A pool cover always makes a wise investment, and you can always go for the cheaper alternative – tarpaulin covers! 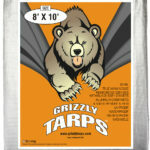 Look for heavy-duty tarps that are water-proof and resistant to many weather elements. If you love the presence of birds but hate having to deal with bird droppings, then covering your property is the best way to go. Bird-proofing your home is not as hard as you probably think. Materials are available in your local garden and hardware stores, or you can make use of some of the household products you already have on hand. Nevertheless, if you think you’ve tried everything and still can’t get all the birds off your property, consider relocating (the birds, of course!). For this, though, you’ll have to coordinate with the proper authorities in your area to make sure that you are not violating any animal laws and that you are after the best interest of the birds as much as yours.